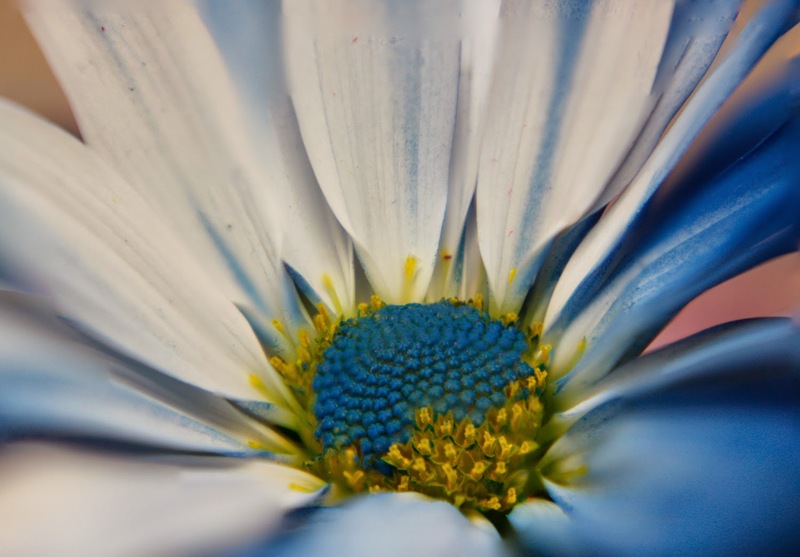 Focus can be a difficult prospect with macro and close-up photography. 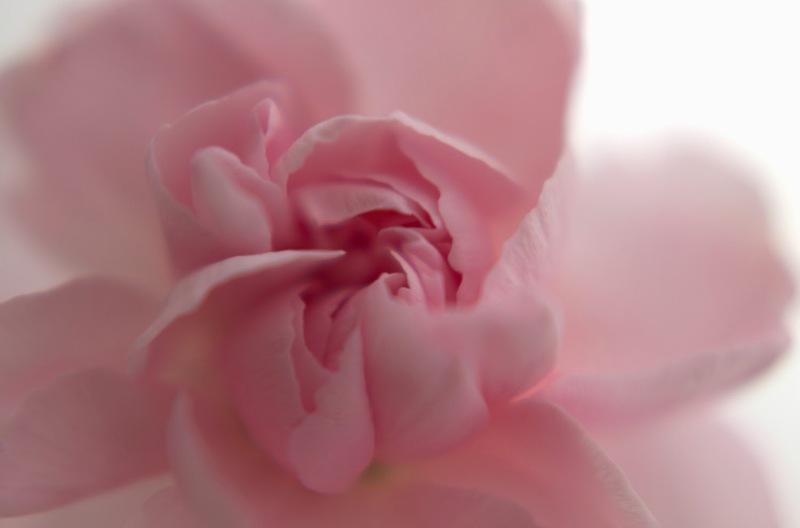 The closer you are to your subject, the thinner your depth of field (the area of your subject in focus) becomes. Even if you use a narrow aperture (like f/22, read more here), your widest depth of field might be less than an inch, front-to-back. Focus stacking is a technique for shooting and combining a series of photographs to achieve focus across as much of your subject as you want. 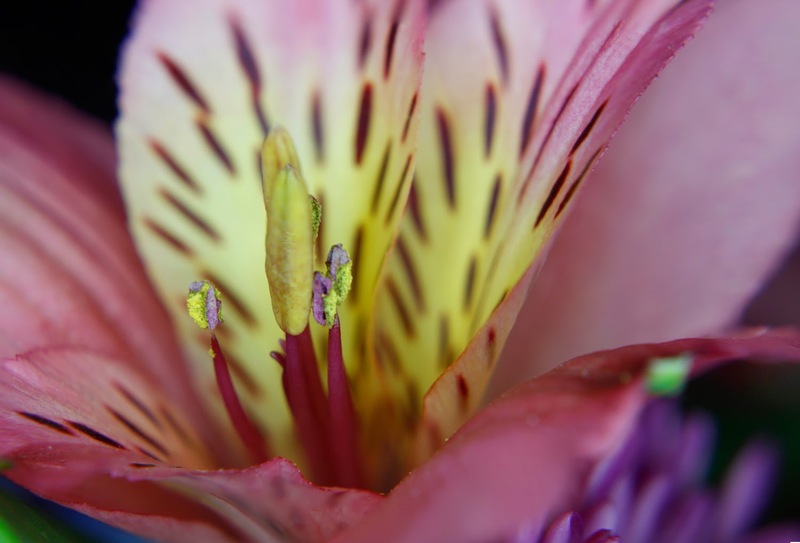 Close-up flower, photographed using 50 mm lens and 10x close-up lens. 3 images focus stacked. Then, think about your composition and exactly which parts of your subject you do or do not want in focus in the final image. Maybe you want every single thing in focus, or maybe you only want one certain area of your subject to be in focus. For this photograph of a flower I knew that I wanted the center of the flower to be in focus, but I still wanted the petals blurred and out of focus. When I took my test shot, I focused on the front of the flower's center, and I was able to get about half of the center in focus. I then took a second shot keeping the back half of the flower's center in focus. You can see that the rest of the petals are not in focus while most of the center (except for the very foreground) is in focus. Since you are using manual focus, the movement required between each shot will be very, very small. All you need is the slightest of leans closer or farther from your subject. Practice looking through your viewfinder (or using Live View, if you prefer) and watching the area of focus move through your subject as you lean in-and-out slowly and slightly. When you are ready to photograph your series for focus stacking, start from either the closest in or farthest out that you want in focus. Take the first photograph, move slightly to adjust the focus, freeze and take the next photograph, and repeat. Once you have your series of photographs with varying areas in focus, you are ready for the post-processing focus stacking step. These directions and 'how to' images are using Adobe Photoshop. 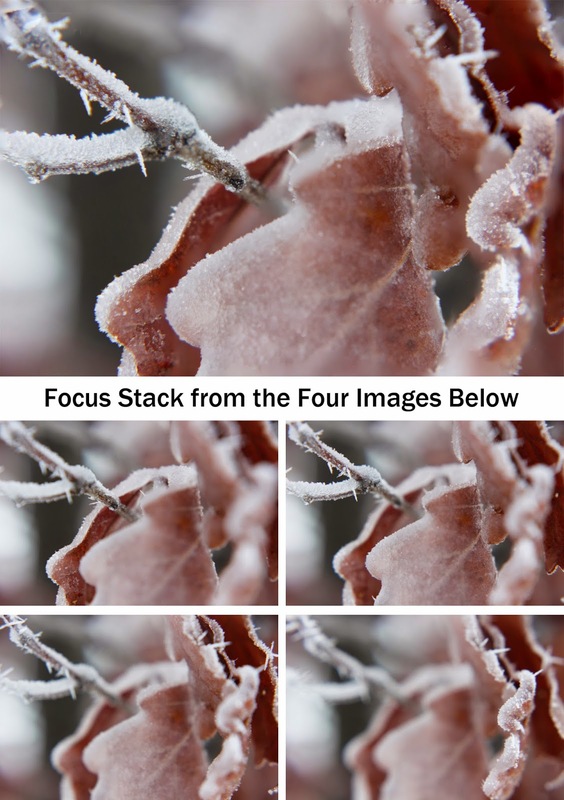 There may be other options available for focus stacking, but this is what I use. The first step is to open each of the individual images in Photoshop. Then you will copy and paste them all into one single file. Hold down shift and click to select each of the individual layers. Then choose Edit -> Auto-Align Layers. I find the Auto projection usually works just fine. Click OK. 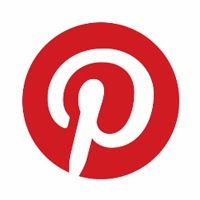 This will exactly line up all of the individual images. Since you have to move slightly to take each picture and change the focus, the images will each be slightly off from each other, and this will correct those differences. After the Auto-Aligning is finished, all of your layers should still be selected. Then choose Edit -> Auto-Blend Layers and choose the Stack option. Click OK. Photoshop will then select the sections from each image that are best in focus and create a composite final image. Click caption to see focus stacked image larger on Flickr. Click caption to see the final image larger on Flickr. This collage shows a comparison of the four individual photographs and the final, focus stacked image. You can see, again, that small sections of the leaf are still not in focus, because the area in focus jumped slightly too much from image to image (for example, look at the middle of the near-middle leaf). The key with focus stacking is always to move very slightly and try to overlap the regions in focus from image to image. Focus stacking is a great technique to try when photographing a close-up or macro subject when you want a larger area of the photograph in focus. Focus stacking allows you to combine multiple images with slightly different areas in focus into one, well-focused final image. The tricks for successful focus stacking and blending are to use manual settings and focus and to make only minimal movements from image-to-image in order to ensure perfect focus. 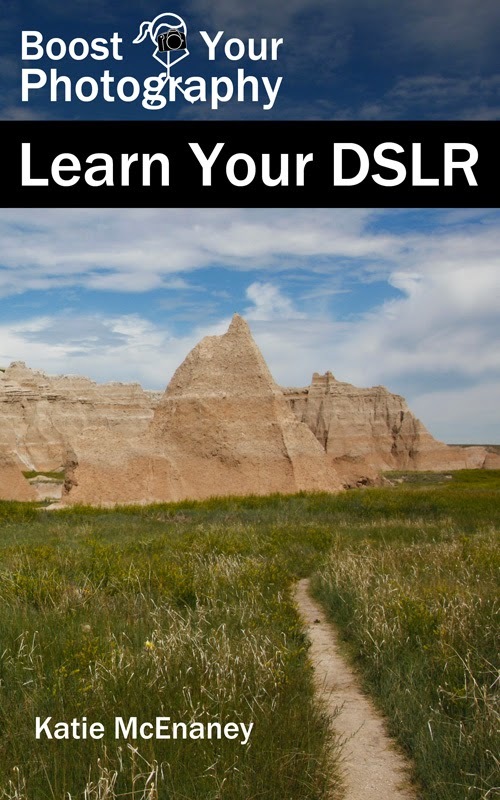 What will you use focus stacking for? Share an idea or photograph in the comments below.